On November 9 1918 the soldiers, sailors and workers of Kiel and Wilhelmshaven rose in revolt at the continuation of a war which had brought nothing but death, disease and food shortages. Within hours the Kaiser was overthrown and workers’ councils sprang up all over Germany in imitation of those that had taken power in Russia only a year earlier. For communists at the time it offered the hope of a further step in the world proletarian revolution. That hope even survived the crushing of the Spartakist Revolt and the murder of Karl Liebknecht and Rosa Luxemburg in January 1919. The revolutionary resistance of the working class carried on for some years but in the end the German state was not overthrown. 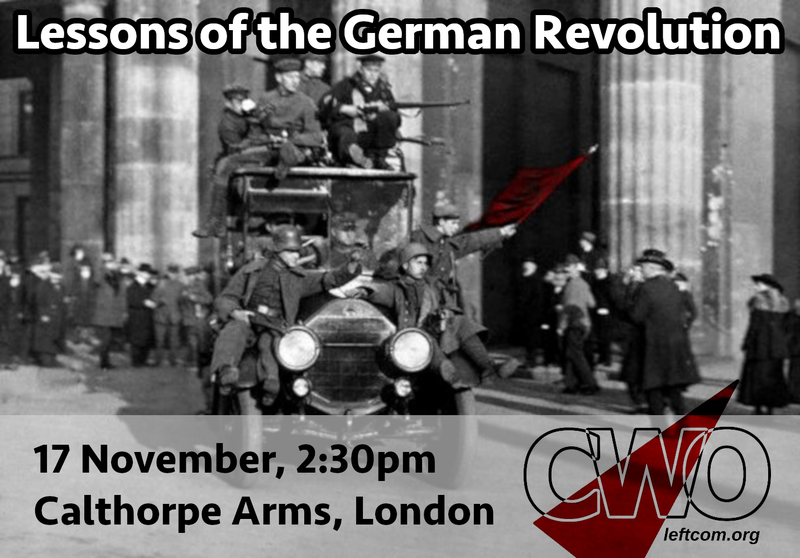 The meeting will explore the failure of the German revolution, the consequences for the world working class then and the lessons for current revolutionaries. A comrade of the Gruppe Internationaler SozialistInnen will be making a presentation alongside the CWO.